Todd Edward Orsbourn, AKA Festus, Cowman, Magic, Tattoo Man, Uncle Todd, and Fun Size!! Todd's death was an unexpected accident in the home. He was born in Endicott, NY, but Knoxville, TN, was where he made his home. He worked in the mobile home industry with many entrepreneurs, but worked the majority of it with Andy Kerney for 25+ years. Todd was a hard-working man, jack-of-all-trades. 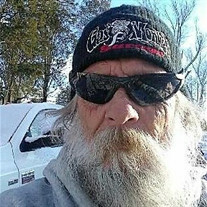 He enjoyed dealing with livestock, running/working heavy equipment, riding the open roads with his friends, and was definitely a Harley man. He was always willing to help anyone in need, never knew a stranger, and he will be dearly missed by all. Todd is preceded in death by his mother Barbara Orsbourn; paternal grandparents Robert and Mable Orsbourn; maternal grandparents Augustus and Lillian Brown, and other relatives and friends that were forever in his heart. He is survived by his loving wife Elizabeth Oliver Orsbourn; father Earnest Orsbourn; son Corey Orsbourn; two sisters Diane Depew and Beth Crattie Orsbourn; brother Eric Orsbourn; and several other beloved aunts, uncles, nieces, and great-nephews. The family will receive friends from 6:00 to 8:00 pm on Thursday, January 17, 2019, at Smith-Reagan Funeral Home with funeral services following. Rev. Shane Pierce will officiate the service. A Celebration of Life Service will be held at a later date.